“It is perhaps the biggest firm you have never heard of. The Boston Consulting Group says it has created more value than any other large firm in the world over the past decade. Yet few people know how to pronounce Vale’s name (it’s “vah-lay”). This giant Brazilian miner has stayed out of the spotlight even as ravenous demand from China has propelled it from insignificance ten years ago to a market capitalisation of $147 billion. It is now the world’s second-largest miner: smaller than BHP Billiton, but bigger than Rio Tinto and other better-known rivals. Vale has grown steadily organically and by small acquisitions from a state-owned local player to a state-backed global player. 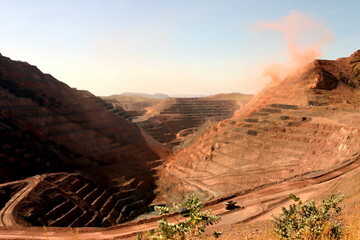 The company is still heavily depending on its iron ore production (65% of revenues, at times an even larger part of profits), diversifying into other metals mainly to hedge risks. Only the fertilizer business is set up to become a future star performer, but this might be frustrated by BHP’s Canadian plans. The capital expenditure of the company in the coming years will by far be superior to the competitors’ investments. Rio Tinto is bound to a $5bln capex for this year, while Vale is said to invest around $100bln in the next 5 years. The vertical integration into transportation is more a necessary evil than a strategic asset. The company started the railway expansion because it could not trust the government to provide the infrastructure required for its operations and it bought bulk tankers mainly because its geographic locations makes ownership of the ships a better option than contracting the shipping. However, the ownership of a fleet might make Vale an interesting partner for various commodity trading houses that are looking to strengthen their upward ties. The pressure of the Brazilian government for local investments is certainly not on top of the management’s mind. Although the government should be kept satisfied to keep te current royalty structure, expansion abroad is crucial for the company’s success, which leads to increased international prestige and tax income for the government. The strong presence in the Brazilian iron ore market is a strategic asset rather than a hinderance. In the shadow of China, Brazil is developing an enormous appetite for steel. Vale is not only the most suitable cultural supplier; its domestic production ensures it is by far the lowest cost supplier to the developing Latin American market too.